Quick Links: Gates Racing OEM Serpentine belt replacement for 1GR Magnaflow Muffler Performance Off road Brakes ELM327 Wifi Connectivity issues with DashCommander BEST PRICE ON ARB Digital or analog Gauges?! Help w/Getting SLOTTED Rotors or Resurface OEM ones? Discussion in 'Performance and Tuning' started by RAD, Oct 25, 2010. I need some new Brakes and got the HAWKS Performance Pads as they've worked amazing on my other past cars. Now, I wanna know if a set of SLOTTED Rotors would be a nice upgrade with them. Should I get some and does anyone know a good Brand/Set to buy? Should I stick to the Hawks on OEM Rotors after a good resurface? Thanks and Looking to invest in better braking compared to OEM. As far as rotors go, I would get new one. Resurfaced rotors will go bad within 15k miles. I have these Power Slot rotors. There are these as well. Nice guys! I'm excited about this upgrade! are those brands the only good ones? I saw some GOLD ones on Ebay I like a lot! Any coloring on the rotor is just a spray on layer of rust protection. As soon as you hit the brakes the color is gone. EBC makes some really nice stuff but nothing for me because of VSC. Call Edwin at RaceShopper.com. SP Performance slotted rotors and Hawk pads. Done. This will be my next purchase as it will be important. 3. Paint OEM Calipers from Ugly Grey to Matte Black. i would take it to an indepentdent shop and have them use an on car lathe. i work with them on a daily basis. the only time a turned rotor goes bad is when it is near its minimum thickness. i can't remember what the magic number is. if you go with slotted rotors you cannot have them turned on a lathe. most shops have the procut lathe or some other variant of it. it doesn't take me more that 30 minutes to cut two rotors and its perfect every time. Thread revival....have you ordered any brake parts yet? I just went that route. Should have them in about 2 weeks. Having said that, I hope you realize that even a slotted rotor will only decrease stopping power on a vehicle like our trucks. A vehicle thats driven aggressively for long periods of time, can benefit from having slots, but usually only if the rotor is larger than normal. You want as much surface area as you can get. For a Toyota Tacoma, a replacement blank rotor is what you want. I promise. Hawk makes some decent pads. I believe they have some truck specific compounds. I've used their "Performance Ceramic" pads and they were decent. The last set of performance brake pads i bought were Carbotech Bobcats. THEY were amazing. Rotors are heat sinks. The pads and rotors work together to turn the kinetic energy of the truck into heat. The more surface area the rotor/heat sink has, the greater stopping power your truck will have because it will be able to dissipate that heat more quickly. I've owned sports cars that have seen road track time and I have seen what other cars were capable of with different brake setups. 9 out of 10 racers have solid, blank rotors and a very nice set of pads. I agree. Look cool, but are designed for the opposite end of the usage spectrum as a Tacoma. Hawk pads are awesome. I love ceramic, but I'm staying with a high-perf metallic because I tow a good bit. Drilled rotors work great for what they are designed for... and that's race or track applications. For street use drilled rotors are basically like a cheese grader on your brake pads. So unless you want go through pads much faster than go with slotted or just plain flat rotors. Unless youve got some huge carbon ceramic discs, Drilled rotors are never a good choice. Holes in a steel rotor are for looks only. They will crack under extreme heat. Take a Corvette for example. The Z06 has 14ish inch drilled front rotors and 6 piston calipers. When put to the test on a track, they are, in fact, insufficient. The rotors almost always crack. 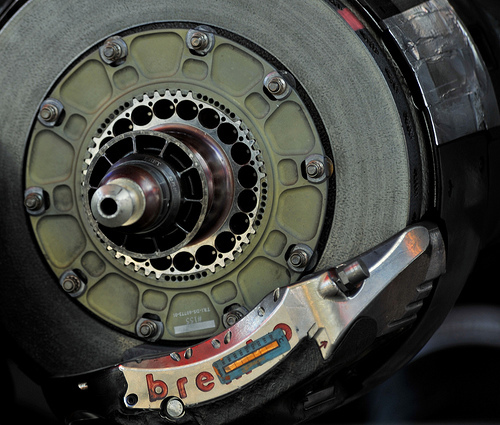 F1 Brakes. Fastest cars in the world don't have holes in their rotors. Not sure why you think the OEM brakes are bad? They feel mushy until you really need them. Anytime I have really needed my OEM brakes, I stop on a dime. This is with 25K on them. Hi , how did you like your braking set up , any good ???? Entire Site Forum: Performance and Tuning Thread: Help w/Getting SLOTTED Rotors or Resurface OEM ones?